A trampoline chair, also known as a bungee chair or bunjo chair, is the perfect addition to any reader’s corner. No home should be without one! Trampoline chairs bring comfort and lounging to an entirely different level. Just because you’re not trampolining, doesn’t mean you can’t enjoy the comfort of a chair that’s closely related to trampolines. They’re just more practical, stylish, and be indoors! 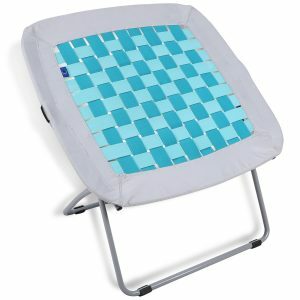 2 Trampoline Chairs – Not Just for Kids! 4.1 What is a trampoline chair made of? 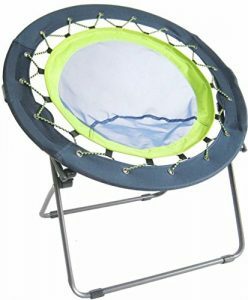 4.2 Are trampoline chairs safe? 4.3 What is the usual trampoline chair weight limit? Our top trampoline chairs amazon picks are outlined for you in perfect detail, so take the time to choose the best trampoline chair price for you! The Bungo Bungee Dish Chair by Zenithen is currently priced around $53 for 1 chair, but you can also get 2 for $104. Each chair has a maximum weight capacity of up to 225 pounds, with a black 600D polyester rim and a teal netted interior made of bungee cords. The steel frame is made for strength and durability, which folds up into a compact size that makes storing it a snap. It has the size dimensions of 25.98”x32.28”x32.68”, with the whole chair weighing no more than 8.2 pounds. 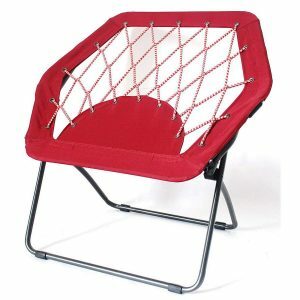 If you’re looking for a good bungee chair for kids, this HEX-brand red chair costs under $40 on Amazon. 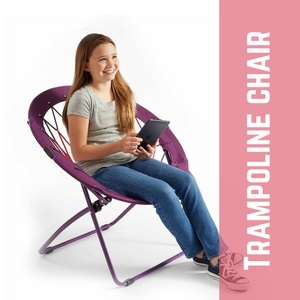 It’s much cheaper than the other options listed in these bungee chair reviews, but can still hold 225 pounds, making it a chair that should be able to be enjoyed by teens and young adults as well. This bright red trampoline chair folds up easily for convenient travel, is more durable than some other chairs that are advertised towards children, and has the size dimensions of 26” x 31.5” x 32”. The chair is made of metal, canvas, and durable nylon cording. It weighs a total of 8.36 pounds. The Bunjo 360 Degree Bungee Chair in Green and Gray by Bunjo 360is currently priced at a flat $44. It’s foldable, has a durable steel frame, and the size dimensions of 32”x32”x25, with a maximum weight capacity of 225 pounds. The bungee chair system is flexible and comfortable, Durable steel frame is rust-resistant. The Folding Bungee Web Chair by REDCAMP will cost you approximately $60. It comes in White & Turquoise as well as Pink & Black. It’s a foldable trampoline chair for adults and kids that has a safety latch lock design when unfolded for stability purposes. It’s able to support up to 250 pounds of weight, persons no more than 6.2 feet in height, and has the size dimensions of 31”x31.5”x31.5”. It’s made out of 600D polyester with a stretch band for strength, durability, and comfort. The entire chair weighs 13 pounds altogether. It uses 16/19mm steel tube brackets for a structural design with powder-coated legs. It’s also backed by a 365-day warranty by the manufacturer, and you can also opt for a 3-Year Accident Protection Plan for $10. 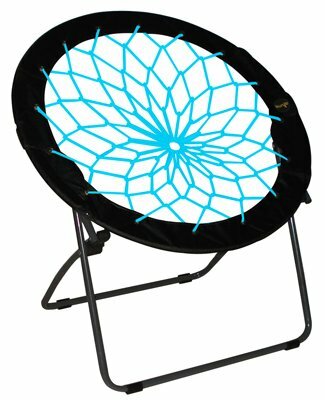 The BlueRound Chair by Impact Canopies has a trampoline chair price of $56. You can pick from 6 different colors based on the model, but each color bunjo chairs, for some reason, costs a different amount, so keep a note of that if you’d prefer a different color. It’s made of 600D fabric with suitable bungee cords, can hold a maximum weight of 225 pounds, and has the size dimensions of 31.5”x32”x27”, with the whole chair weighing only 8 pounds. Trampoline Chairs – Not Just for Kids! A good trampoline chair is just as comfortable as any lounger. They’re stylish, practical, easy to transport, and offer a lot of comfort! When searching for the best trampoline chair around, there are a few important factors that you should be looking for. Here’s some things to keep in mind when you’re reading through bungee chair reviews. Firstly, you should consider the weight limit of the bungee chair. This will determine whether or not you can actually use a given chair. If you weigh more or even close to the maximum weight limit (which is often slightly inflated by the manufacturer), you should seek out a larger or stronger chair instead. 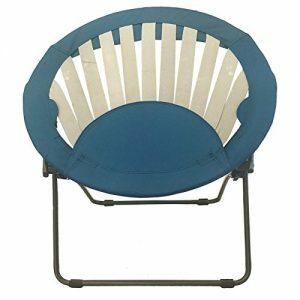 The durability is the second most important factor to consider when reading bungee chair reviews. Some bungee chairs are only designed to be used infrequently. Others are strong enough that you can enjoy daily use. Most people would prefer the latter, so you should see if the reviewer or manufacturer has labeled a chair as being strong enough for such activity. The durability of a trampoline chair is usually determined by the materials it’s made out of. Most bungee chairs will use nylon bungee cords, which give a good bounce but will also spring back into shape. Metal legs are preferred because they can better carry your weight – the RECAMP chair uses steel, which should be tough enough to handle just about anything. Then there’s the material of the chair itself, which is the part that’s most likely to get ripped, torn, or otherwise damaged. Polyester is common and usually works for most cases. Plastic tarp is going to be the most weather-resistant if you like to use your chair outside, and will also be the most durable and easiest to clean. However, some people think that the plastic chairs look tacky or ugly. In the end, much of what you choose to look for in bungee chair reviews will depend on your personal preference and what you personally want from your trampoline chair experience. If you don’t see your question listed below in the FAQ section, let us know! What is a trampoline chair made of? A trampoline chair, or bungee chair, is typically made of bungee cords and either steel, metal, or plastic for the frame and the legs. Yes, they’re very safe. As long as you don’t horse around too much on them and actually use them as a chair, as they’re intended to be used, you should be fine. What is the usual trampoline chair weight limit? Based on our research, the typical trampoline chair weight limit is generally around 225 to 250 pounds per single chair. You can read about trampoline weight limits in our article here. If you like bungee chair reviews, be sure to check out our ultimate guide to bungee trampolines! We hope that these bungee chair reviews have made it easy for you to decide what trampoline chairs to buy. These affordable chairs are breathable, comfortable, and will give any room or patio a futuristic look. What’s not to love?